Every so often I have to put a comic back. I try very hard to be impartial about what mini-comics I pull to review, but there have been times when, upon opening a book, I decided not to review it. Usually this is because the mini is actually a ‘zine, which I just don’t have the time to really dive into at work (what with them being text-heavy). Occasionally it’s because the comic is such a mess that I couldn’t find anything positive to say (which I’ve discussed in an earlier review). Once in a while it is because the artist seems to have fallen off the face of the planet. Such is the case with Lewis the Dog by K. Rose. I enjoyed this comic, but I was also unable to find ANYTHING about it or the author online. This alone wouldn’t normally deter me, but it doesn’t appear to even be listed within Forbidden Planet’s database. I don’t have any information or imagery to go accompany a review. So regrettably, despite having typing up review notes, I was forced to grab a different comic for review. Let this be a lesson folks: it is VITAL to have some sort of a web presence! But let’s move on. This week’s pairing, by coincidence, share a common theme. 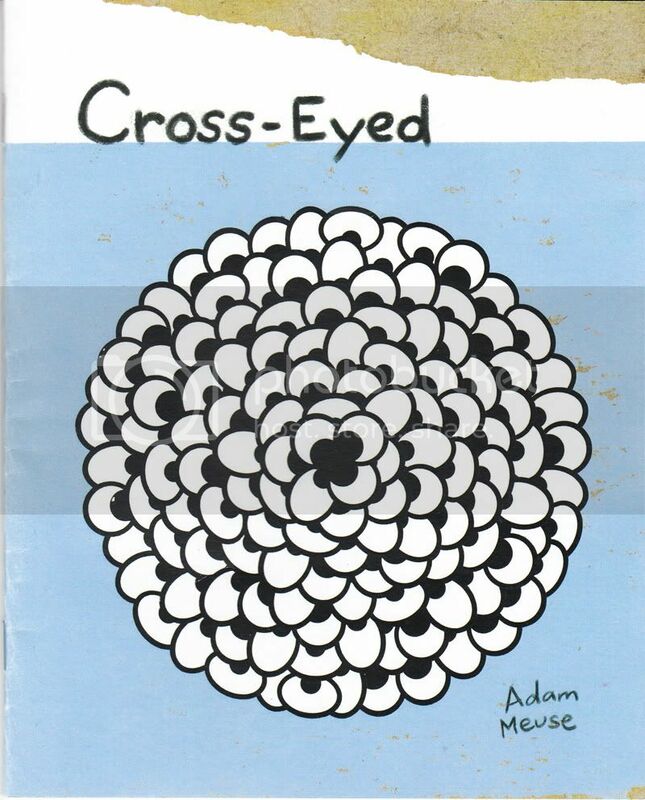 Apart from merely referencing eyes in their respective titles, both comics explore how we see ourselves. 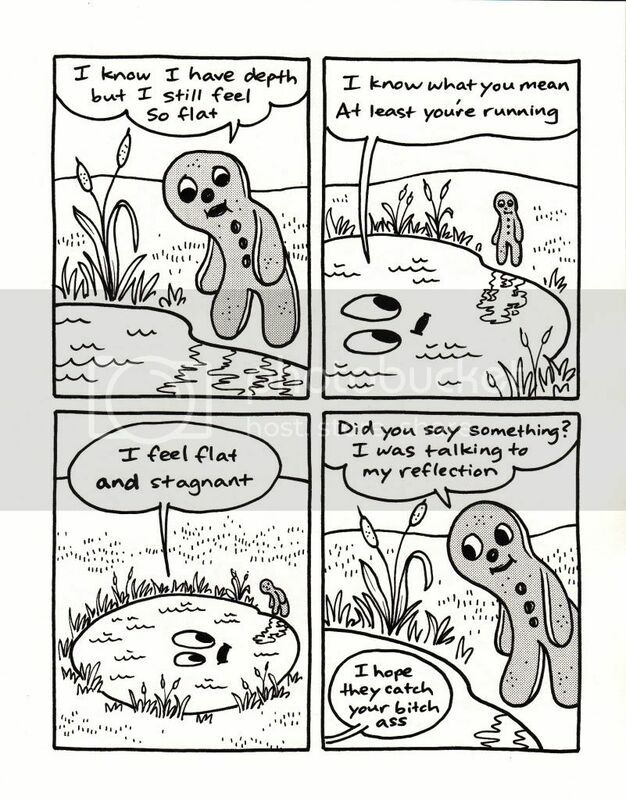 Last week I reviewed another comic by Adam Meuse, Sad Animals. That comic I felt was fun, but not terribly deep. Cross-Eyed strikes a much better balance; managing to be very funny without sacrificing poignancy. As I’ve mentioned, I grab these comics at random; usually based on whichever cover appeals to me. Apparently there is something about Meuse’s cover designs that I find very appealing. His art has a refined simplicity that he uses to evoke dynamic compositions. This is also true within the book; an approach that is particularly suited to the book’s theme. 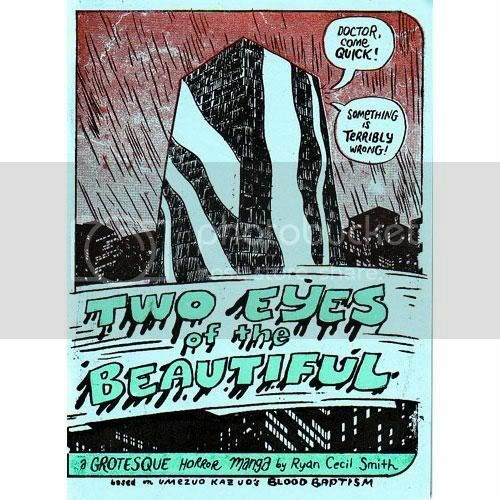 Two Eyes of the Beautiful by Ryan Cecil Smith (based on Umezuo Kazuo’s Blood Baptism) is the first part of a larger narrative about a glamorous starlet who is turns to a shady doctor to cure a disfiguring disease. As is often the case in morality tales and fables in which vanity is the main theme, the “cure” comes in the form of a blood sacrifice and the sacrifice of the subject’s basic humanity. 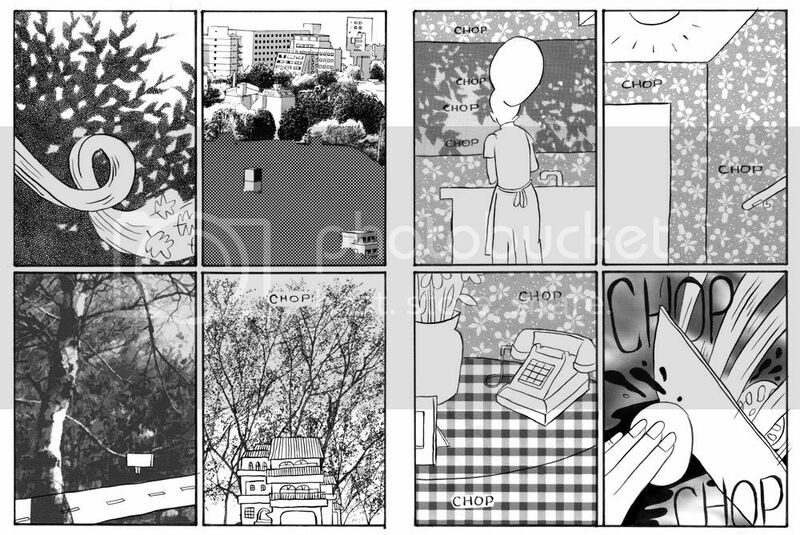 Drawn in a manga style, Smith plays with many of manga’s tropes and clichés to create an emotionally charged, sinister atmosphere. Pages are a collage of styles and aesthetics, which work to keep the reader off-balanced. Additionally, the author uses distortion and exaggerated forced-perspective to turn characters instantly into monsters. These distortions, coupled with the loose quality of the line-work sometimes work against Smith; there is a fine line between what the author is trying to accomplish artistically, and sloppy draftsmanship. When it works, it works very well. When it doesn’t, panels can be difficult to read. However, those are minor quibbles. This is a very interesting book. I’m generally leery of western manga art; I tend to find the results awkward and derivative. But I was pleasantly surprised by Two Eyes of the Beautiful. Smith uses the manga style intelligently and in a way that enriches the story.